Editor’s Note: HARP expired 12/31/18. However, Fannie Mae and Freddie Mac recently rolled out new High LTV refinances. Read about them here. This post will remain active for archival purposes. If your home has lost value since its purchase, the government wants to help you refinance. As part of a national outreach program, the Federal Housing Finance Agency (FHFA) has singled out hundreds of thousands of U.S. households still eligible for the agency’s Home Affordable Refinance Program (HARP). Perhaps your home is one of them. The HARP Refinance program allows homeowners to lower their mortgage rates to current market levels without requiring new private mortgage insurance (PMI) policies. Without PMI, loan costs stay low, which amplifies the monthly savings of a refinance. The typical homeowner that refinances using HARP will save more than $60,000 over the life of their mortgage; and, because of zero-closing cost mortgages, those savings go straight to the bottom-line. However, if you want to use HARP, it’s best to act soon. The Home Affordable Refinance Program, which launched in 2009, its nearing its end. After December 31, 2016, the HARP mortgage refinance will be retired. The Home Affordable Refinance Program is relatively new. It was established in early-2009 as part of the government’s Making Home Affordable plan, which was meant to slow the retreat of the U.S. housing market. At the time, the U.S. economy was deep in recession and consumer confidence levels were low. High-profile banks had recently failed and home values were dropping more than 10 percent per year. Job growth was negative. Consumer spending was weak. A downward economic spiral was in effect. Making Home Affordable was launched with two main elements. The first element — the Home Affordable Modification Program (HAMP) — sought to help homeowners who were behind their mortgage payments, and at risk for default. Fewer homes foreclosures, the government reasoned, could help to stabilize home values in many U.S. cities. Making Home Affordable’s second element was the Home Affordable Refinance Program (HARP). Commonly called the “Obama Refi”, HARP gave homeowners who were doing a good job paying on their existing loans access to new loans at lower mortgage rates with preferred terms. This was a big deal because, with home values dropping sharply nationwide, homeowners had lost home equity. At the same time, mortgage rates were dropping fast. Homeowners wanted to refinance, but the savings weren’t there. Offset from lower mortgage rates was often countered by a loss in home equity, which triggered the need for private mortgage insurance payments. That is, for homeowners that even had home equity to begin with. As home values dropped, millions of homeowners suddenly owed more on their mortgages that their homes were actually worth. These “underwater” homeowners couldn’t access refinancing at all. And this is where HARP helped out. The HARP refinance program gave homeowners who had lost home equity the ability to refinance without having to pay new private mortgage insurance. The government said: If you don’t pay PMI before you HARP, you don’t pay PMI after you HARP. The program has been a hit. More than 3.4 million U.S. households have used the HARP refinance to lower their monthly payments since 2009. The program has been used on primary residences, vacation homes, and investment properties. It’s been used in all 50 states, Washington, D.C., and Puerto Rico. It’s been used for homes where home equity growth is returning, and it’s been used for homes where the loan-to-value exceeds 200%. The HARP loan is a refinance program backed by the Federal Housing Finance Agency, which is the parent organization of both Fannie Mae and Freddie Mac. This means that, in order to use HARP, your current mortgage must be a conventional mortgage. You may not know whether your current loan is a conventional mortgage. However, because more than half of all new home loans are conventional, you can usually use the process-of-elimination to figure it out. Is your loan an FHA loan? If it is, your monthly mortgage statement will say so. Is your loan a VA loan? If you are a veteran or active duty, it’s likely that it is. Did you do 100% financing? If you did, and you’re not military, your loan is likely USDA. Most other loans are conventional, which means you may be HARP-eligible. There are only a few qualifying criteria in order to use HARP. Additionally, your home’s loan-to-value (LTV) must be greater than 80 percent. If you can meet the above criteria, you’re likely HARP-eligible and the government wants you to know about it. There’s money to be saved — especially given today's mortgage rates. Since the start of the year, HARP mortgage rates have dropped more than forty basis points (0.40%), and rates are down more than 300 basis points (3.00%) from late-last decade. Today’s HARP homeowners are saving 30% or more on their payments. Where Can You Use The HARP Program? The Home Affordable Refinance Program has been used more than 3.4 million times since its inception. The program terminates December 31, 2016. That doesn’t leave much time to make your application. And, unfortunately, a large number of HARP-eligible households will choose to skip the program entirely, wasting tens of thousands of dollars in the process. This is why the government has started its outreach program. HARP is good for housing, and the FHFA wants to make sure you know it. Through a series of Town Halls and conferences; and, advertisements; and, Twitter chats among other channels, the Federal Housing Finance Agency has worked hard to dispel the feeling that HARP is “too good to be true”; or, that paperwork requirements are too onerous. Some borrowers have even said that they fear high closing costs. The concerns are all unfounded. Despite these points, there are fewer HARP loans closing than during any period since the program’s inception. The government feels people are missing out. To that end, it’s published a county-by-county list of the country which shows where HARP-eligible homeowners are concentrated. The list does everything but show home addresses. To be “HARP-eligible”, loans must meet basic HARP loan criteria including having an origination date prior to June 1, 2009; having a loan-to-value greater than eighty percent; and having no late payments in the last six months and, at most, one in the last twelve months. Loans must also have a remaining loan balance greater than $50,000; with at least ten years must be remaining on the loan’s term; and, with a current note rate of approximately 5.00% or higher. According to the government, there are approximately 400,000 HARP refinances just waiting to be done. As part of its outreach program, the Federal Housing Finance Agency compiled a list of HARP-ready households, sorted by state. Florida, Illinois, and Michigan are among the ten most HARP-ready states; and Montana, North Dakota, and South Dakota are among the least HARP-ready. 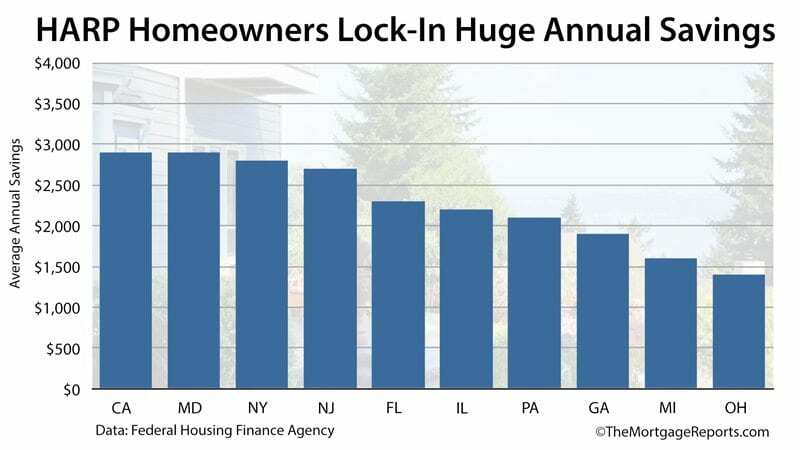 This is, in part, because homes must have less than twenty percent equity in order to be HARP-eligible and home values throughout Florida and Illinois have yet to recapture the losses of last decade. The role of home values in the HARP program explain why California is no longer #1 on the list. Values have climbed as much as 35% statewide since 2012, lowering the Golden State to a sixth-place ranking. On a county-level basis, there are an estimated 28,00 homeowners eligible for HARP in the Chicagoland area of Illinois; and 16,000 in the New York City metropolitan region, an area which includes Newark, New Jersey and parts of Pennsylvania. There are roughly 15,000 eligible households surrounding the cities of both Detroit and Atlanta. The HARP refinance program is nearing its expiration date. Don’t skip your change for lower a mortgage rate and a lower monthly payment.